Jose LaGuerre has had a career in the medical field for the past 15 years. He’s responsible for managing and directing the admissions process in healthcare facilities (hospitals, doctors’ offices and nursing homes) as an administrator and technician. 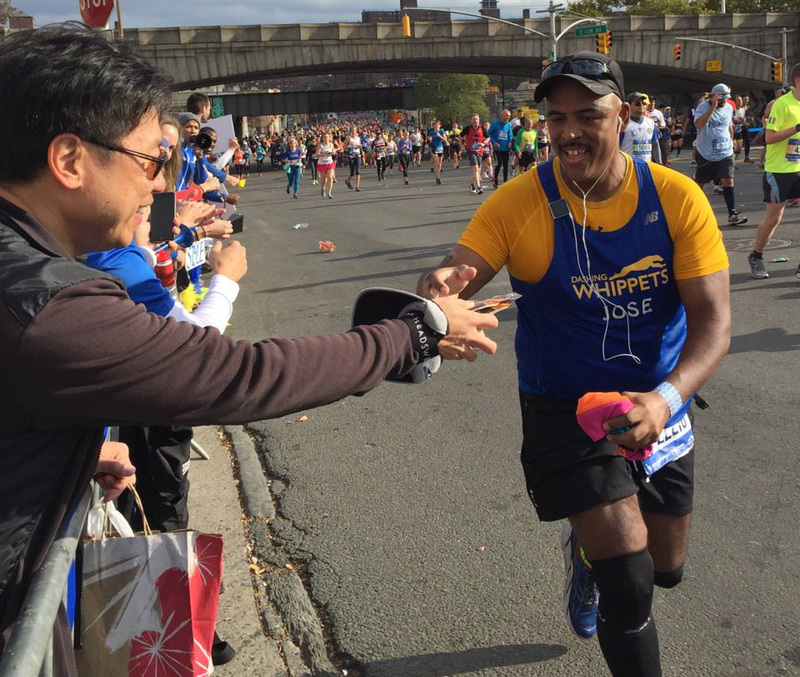 Jose’s true love of running didn’t find him until 2 years ago when he joined the Dashing Whippets. The amazing team camaraderie got him going. He believes that the team’s track workouts and team spirit was unlike any other that he knows. Once I was bitten, it was all over. Running and I began our love affair. We started making steady dates, even meeting on the sly when everyone else in the house was gone. Yes, it was bad. A lot of my friends thought my running fascination was more of a passing trend that would fade away after I finished my first marathon. But when I kept plugging away at the miles even after the finishing medal was around my neck, many were mystified. When I try to explain to my non-running friends why I love this running thing so much, I’m usually met with blank stares, even snide comments. Now I’m 6 Marathons in, with 20 half marathons, 1 tough mudder and almost 70 lbs lighter. I’m known to most of my running buddies as the music man. I’m usually carrying beats for the runners around me while pushing them to the limits. I’ve stopped trying to explain to my non-running friends my obsession with the sport. I’ve also stopped trying to explain what the finish line means to me. I’ll never convince someone that running makes them a better person. If they want to understand my passion, they’ll have to lace up their shoes and try it themselves. Even then, they may not see the attraction, and that’s OK. I need these friends in my life. They give me balance.